You’ve likely heard that there will be some big changes in the broadcast TV industry in February of 2009. But there’s a lot of misunderstanding out there about what’s exactly changing, and which situations the change affects. The condensed version is pretty straightforward: if you have satellite (DirecTV or Dish) or cable TV, these issues don’t affect you. The equipment you have (receiver and/or cable box) will continue to output the same signal you currently receive. But if you have an antenna, and you aren’t using it exclusively for HD, then you’ll likely need to get some new equipment by February of 2009. Essentially, the issue is that the FCC (the federal government agency regulating the airwaves) gave out to broadcasters additional spectrum for them to broadcast digital signal – both standard definition (SD) and high definition (HD). As part of this program, the FCC also took back the spectrum these broadcaster were using for traditional analog SD transmissions. But to make the transition less painful, they allowed for an overlap period where broadcasters could use both the analog and digital areas of the spectrum allocated to them to broadcast both simultaneously. We are in this transitional period currently. So to be totally clear, this change only affects customers who use that which will be taken back by the FCC: analog SD antenna broadcasts. They want the airwave spectrum back. They really don’t care (at this point) what goes through cable wires or satellite transmissions. Most, but not all, standalone TiVo DVRs, including the HD models, can receive these transmissions. So if you have a TiVo set up with antenna reception, you’ll likely see at least some change in February of 2009. If you only have antenna as a programming source, you’ll need additional equipment to keep receiving channels (coming to that). If you have antenna as one input source, but you have others, you may not care about the difference. If you have an HD TiVo connected to an antenna, you’ll basically lose the analog channels, but retain the digital ones. So if you currently receive 7, 7-1, 7-2, and 7-3, you’ll lose the basic 7, but you’ll retain the 7-1, 7-2, and 7-3. The newest list of digital channels broadcasting nationwide is generally here. The FCC didn’t want to render all of the analog equipment out there useless, so they’ve been working with a few manufacturers to get converter boxes produced. Otherwise, all older TV sets (pretty much any non-HD TV), VCRs, and DVRs would be useless. So the converter box works, in a sense, like a cable or satellite box, taking one type of transmission (digital antenna broadcasts) and tuning and converting that to an analog output for a TV, VCR, or DVR. The result is that the converter box must tune the channel, rather than the TV, VCR, or DVR. This may make some installations more complicated. It will certainly also prompt many users of older equipment to just upgrade their equipment, rather than to get a converter box. Most newer TVs include digital tuners now. In fact, the FCC requires any TV sold at this point to be capable of tuning digital antenna transmissions internally (and they fined some companies recently for selling equipment that didn’t comply). 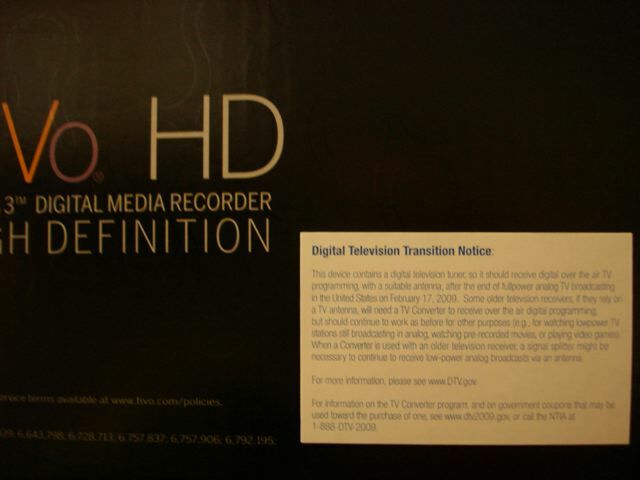 So any TV purchased after March 1, 2007, should be able to receive digital antenna signals. In the TiVo world, this likely explains why TiVo’s latest standard definition DVR, the Dual Tuner model, lacks antenna input totally; they wouldn’t be able to sell this unit at some point since it would have analog but not digital antenna capabilities. So the Series3 complies with the FCC regulations. It receives both analog and digital inputs via the antenna port. The TiVo HD has the same capabilities in this regard. This transition won’t affect most TV and TiVo viewers – all of those with DirecTV, Dish, and cable. It only will affect antenna users, and of those, only users who get analog channels still. For those users, they can either get converter boxes to use with their TiVo (TiVo hasn’t released full information about which DVRs will support what converter boxes) or they can get a newer HD TiVo and begin to receive the digital antenna broadcasts. So does this mean that all Tivo’s sold now can handle over the air broadcasts? Or only certain units? Only HD ones can without converter boxes. But any Series2 can use a converter box to record digital OTA signals. My Series 2 TCD 20040 is inoperable now that the Comcast Cable co. had to put an adapter onto my telvsion (I have an oldet that is not digital). Is there a way my TiVo can be updated so it will work with this new set up. Or doI have to buy a new TiVo that has HD capabilities AND a new TV with HD?